The Infomercial Secret Of The "Unique Mechanism"
So What Is The "Unique Mechanism"? 5 Real-World Examples Of "Unique Mechanisms"
In saturated and competitive markets, detailing your product's "Unique Mechanism" is essential. And that's why it's become one of my go-to strategies in almost every funnel I set-up. See: The "Unique Mechanism" is THE thing in your marketing that gives your prospects hope that this time, with your offer, things will be different for them. That... no matter how many different things they may have tried in the past... this time... with your offer... they will finally get the results they're after. It's the part, piece, component, process or aspect of your product or service that delivers the results. It's the thing that makes your product or service different in HOW it fulfills on your promise. You see: In saturated and competitive markets, there's a good chance the most compelling promise you can make to prospects has already been presented to them by one or more competitors. Making the same promise, obviously, will only get your marketing message lost in the noise of every other marketing campaign. And simply enlarging the promise -- promising even more or bigger, faster results -- immediately triggers skepticism and doubt within prospects. Especially prospects at the higher levels of "marketplace sophistication". Presenting a "Unique Mechanism", on the other hand, allows you to present the most compelling promise to prospects -- even if it's already being presented by competitors -- and gives you something unique to hang that promise on. In other words, when you build your marketing message and primary promise around your product's "Unique Mechanism", you're able to excite prospects about the results you're promising by showing them how you deliver those results in a different and unique way from anything they've tried before. And like I said, doing that gives your prospects newfound hope in your product's ability to deliver the results they're after. No matter how many times they've been let down in the past. And that's why the "Unique Mechanism" is used over and over in expensive infomercials. 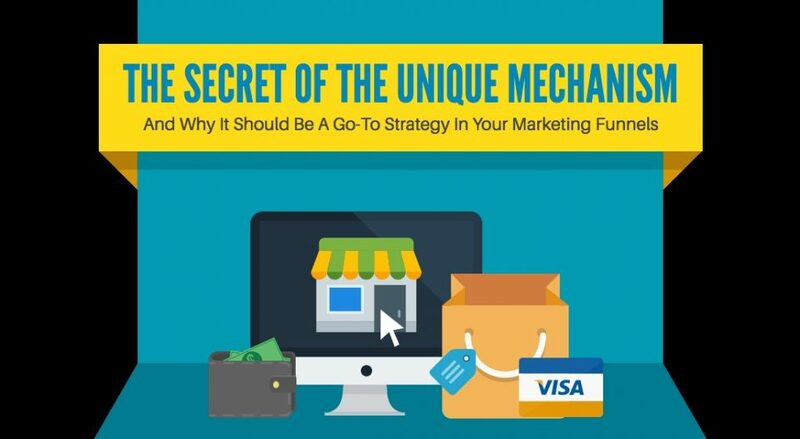 Because when money is on the line, demonstrating a "Unique Mechanism" is one of the most effective tools in your marketing toolbox. Below you'll find 5 real-world infomercial examples of how a "Unique Mechanism" is presented. NOTE: Each video will play right at the point when the "Unique Mechanism" is presented in the video. Feel free to rewind each video if you want to watch the entire infomercial. "...the secret is the small recessed blades that..."
"...the newest technology in non-stick cookware made with ceramic and super-strong titanium..."
"Grill Daddy's patented steam-clean technology melts away..."
"The secret is the accordion design that..."
In every infomercial there was a promise of benefit and results. And they explained how that promise was fulfilled and delivered by a "Unique Mechanism" -- a piece, part, component or aspect of their product that is unique and proprietary. Which one you use is dependent on a couple of factors: how your product or service is designed, what competitors are and are not saying about their own offers, and the "marketplace sophistication level" of your prospects. Regardless, EVERY product or service... no matter the price-point, niche, or actual uniqueness... can and should be presented with a "Unique Mechanism". It's THE thing that can take an ordinary funnel... and make it a grand-slam winner for you. If you'd like to learn more about each of these 3 different "Unique Mechanism" types... when to use each, how to create them, and how and when to present them in your marketing funnel, go here.